ARLINGTON, Texas (AP) — Adrian Beltre had a sometimes-imposing stare and plenty of quirky habits. He also had a genuine love for the game, and a lot of fun in a Hall of Fame-caliber career. After 21 big league seasons in which Beltre hit 477 home runs and became the first player from the Dominican Republic to have 3,000 hits, the slick-fielding third baseman for the Texas Rangers retired Tuesday at age 39. Beltre, who will be eligible for the Hall of Fame ballot in five years, was a .286 hitter with 1,707 RBIs in 2,933 career games. His 3,166 hits rank 16th on the career list, with his homers total 30th and RBIs 24th. He played 2,759 games at third base — only Hall of Famer Brooks Robinson had more. The four-time All-Star and five-time Gold Glove winner was 19 when he made his big league debut with the Dodgers in 1998. Beltre played with Los Angeles until 2004, the Seattle Mariners from 2005-09 and the Boston Red Sox in 2010. He joined the Rangers on a $96 million, six-year free-agent deal in 2011, and appeared in his only World Series in his first season with Texas. 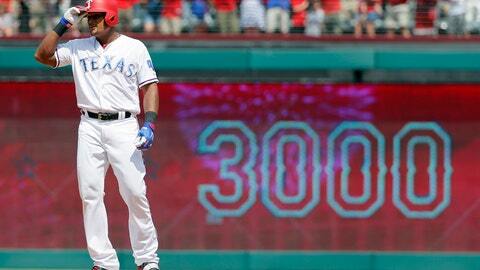 Beltre often checked his own swing to umpires and hated being touched on the head, which teammates often exploited. There were the shuffling feet and swiveling legs in the batter’s box on inside pitches or those in the dirt. There were those times when Beltre and Andrus would be only a few feet apart on the left side of the infield, both with their gloves in the air, one mimicking the other catching a popup. There was a pitching change at Seattle in 2013 when Beltre threw his glove at a fleeing Andrus after being popped on the head with a glove by the shortstop. In his statement, Beltre thanked former Dodgers manager Tom Lasorda, then the team’s interim general manager, for “believing in this young kid from the Dominican Republic when others thought I was too young to be called up” to the majors. Beltre was only 15 when he first signed with the Dodgers as an amateur free agent in July 1994. Beltre hit a Texas-high .273 with 15 homers and 65 RBIs in 119 games this season, when he went on the disabled list twice because of a strained left hamstring. He was limited in 2017 to 94 games, his fewest since 77 as a rookie, because of calf and hamstring issues. Michael Young, now a special assistant to the general manager, was the Rangers third baseman before Beltre joined the team. Young then became a utility infielder and designated hitter and is still the career leader for games played and hits by a Rangers player.